Created in 1984 inspired by a visit to Israel and in part inspired by the book ‘Legends of Jerusalem’. 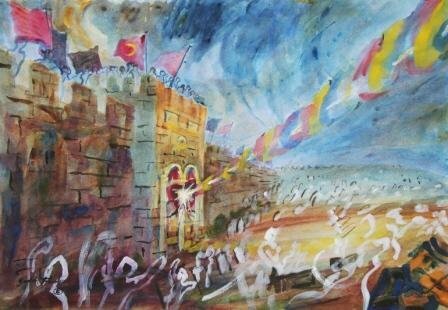 Legends of Jerusalem: A Prophetic Symbol, the East (Golden) gate of Jerusalem was deliberately blocked centuries ago by Muslims. The Eastern Gate except that it was the only gate of the city that led directly onto the Temple Mount. The old walled city has eight gates, the Eastern Gate, and it alone, is sealed.